Welcome to the Mackenzies / McBrides series! 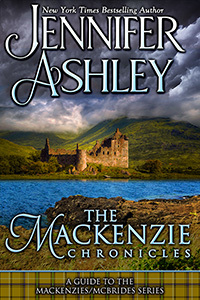 The Mackenzie Chronicles is a guide put together by Jennifer Ashley to the books in the world of the Mackenzies. In this guide, you’ll find character sketches of the main couples in each book, a brief synopsis of each story, an excerpt for that book, and Jennifer’s notes and thoughts about the story and the characters—challenges she faced as well as what she enjoyed most. The Chronicles includes a family tree, a series timeline and reading order, plus publication order and a guide on how to find the books. It all begins with The Madness of Lord Ian!